PRICE REDUCED!!! 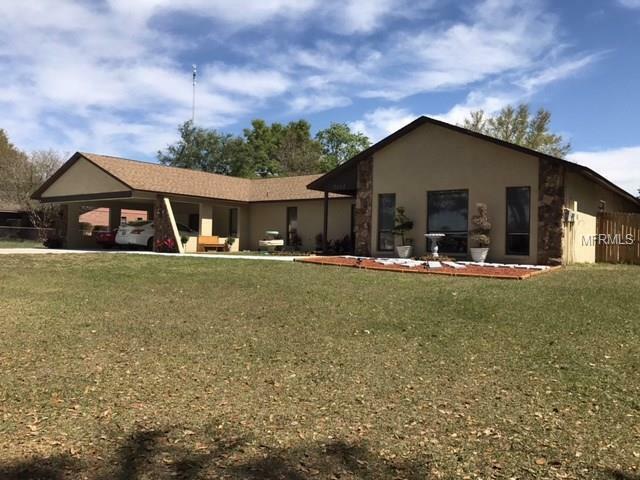 Stunning Ranch Style home with 5 bedrooms and 4 bathrooms on a beautiful 1.31 acres with over 4,000 sqft of living area. This home boasts two Master Suites. All bedrooms are very spacious and have brand new carpeting and three of them have walk-in closets. Entering this stunning home through the living area with high ceilings and Stone Fireplace. The living room, family room, dining room and the Florida room along with the large lanai over looks the beautiful 20x40 swimming pool and all is privacy fenced in. Enjoy a game with the family in the Huge fully furnished Game Room. There are 2 Large Outbuildings as well for added work space, storage or RV parking. Property has a well and 2 septic tanks.Great location in the country but close to all amenities including shopping and entertainment.